Starting tomorrow in Cairo, you can attend the “Doum Storytelling Nights,” a return to the art of oral storytelling:By Mona Elnamoury This storytelling night event — at Bayt al-Sennari, Sayda Zainab — is carried out by the Seshat series for creative writing workshop, which now hosts around fifty writers of different ages and both sexes.The workshop, which is a “Doum” project, has been moderated by novelist Sahar Elmougy.Elmougy has been at the center of reviving cultural interest in the art of oral storytelling ever since her first feminist storytelling venture about women and memory “Qalat al-Raweya” (“The Female Narrator Said”), a 2009 project of revisioning/ rewriting folk tales from a feminist perspective. After that, there was “Ana al-Hekaya” (“I am the Tale”). Co-establishing the non-profit Doum Cultural Fundation with novelist Khaled Alkhamisi helped Elmougy further the idea of culturally engaging with as many people as possible. 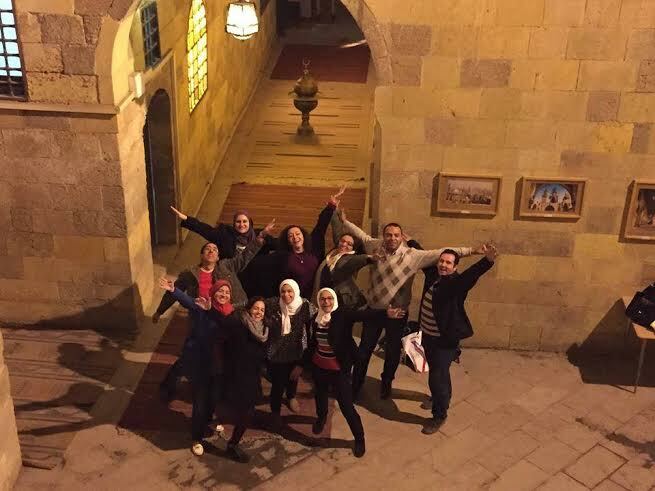 Doum’s mission is to foster critical thinking in Egypt by producing cultural material capable of reaching as many people as possible.The idea of the workshop has been to create a common field among writers to develop their creative and critical capacities and tools. It developed beyond the literary output of the workshops into creating a human bridge between the writer and the audience; the stories become interactive areas of identification and awakening. Away from the clichés of the aloof cultural product in books or in isolated cultural forums, the Doum Storytelling Project assures both writers and audience that they can find a basic unifying ground in which there is neither barriers nor discrimination.The content of the upcoming event constitutes everyday stories centered on our life experiences, feelings, expectations, and aspirations, all braided into one overarching narrative. The stories seem to point out that as many roads there are — roads of loneliness, union, answers, or questions — they are still familiar and human, and they still intersect.The first Doum storytelling events took place during Ramadan 2014, and they conveyed many themes, gratitude among them. They were such a pleasant surprise. Preceded by months of training and awakening great narrative potential of the selected narrators, the upcoming event, “Ping-Pong,” is even more professional and sophisticated. Attending Ping-Pong at Bayt al-Sennari, you are promised a performance that will push you to laughter, tears, and wonder. More important it will push you to think and rethink of sentences that will sound wonderful and astonishing though they are familiar. You will be haunted by questions for a long time while driving, bathing, and making coffee or when you put your heads on your pillows at night. Questions are all that matter. Dr. Mona Elnamoury is a lecturer at the faculty of Arts, English Dept., Tanta University. She also teaches at the MSA in the faculty of Languages and Translation, and has translated Ursula LeGuin into Arabic and is part of the Seshat continous creative writing workshop and storytelling project. She also writes.